"Don't Look Into the Light"
Reminds me of a protea ... a flower from South Africa. I was using mobile Safari, but like another said before it may be an issue with the browser and not the image itself. This is a great wallpaper. I love underwater images. I only wish that the pink tentacles didn't all seem like they were all facing inward toward the center but rather would appear more free flowing like they would in the water. Really clear and nice looking on all my devices though! 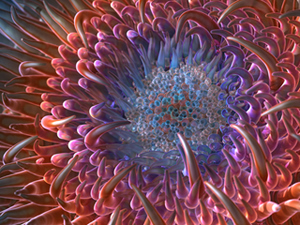 Have you ever considered rendering some images in stereoscopic or anaglyph 3d format? I have rendered some of my own designs in anaglyph 3d and they are very nice. 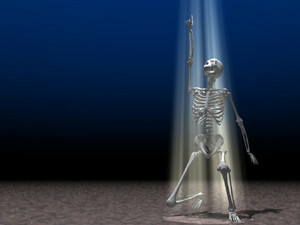 Lightwave also has a good setup for creating either type of 3d. I know that some designs wouldn't work well because you woud have to render 2 full images, but I was curious to know your thoughts on 3d rendering. I've noticed this in mobile Safari in the new iPad: when viewing a 2048x2048 image it reports the image in the tab bar as "1024x1024" instead of its real resolution. But when saving it it saves properly. I think this is because the "CSS pixels" that the browser uses they lay things out with are actually 4 "devices pixels" and, even though there is no CSS involved in displaying the image alone, the browser is still using CSS pixels. It's very good, but in the dual screen render, I find the far right side disappointing and uninteresting - just a blurry mess of pink. Dude, This is just brilliant. Up there with glowy blue mushrooms. Congratulations. "Re: iPad 3 Resolution (Walo and Mike)"
Can I ask what browser/OS you guys are using? I just downloaded it using Chrome on Win7 and it displayed the proper 2048 x 2048 file. I also have this problem with the new ipad, the image is shown as 1024x1024 pixels. The tab description reads "anemone22048x2048.jpg, 1,024x1,024 pixels"
This version is so vivid, I finally replaced Circumpolar as my cellphone wallpaper with this one! I had to crop the image a little from the iPhone 4 version, since my phone has "only" 540x960 pixels... Still, it looks absolutely awesome, and I enjoy it every time I check for new messages etc. This makes for relatively good wallpaper, but I would really prefer to see more anemones and less of a close up as in the original image (the original is one of my all time favorites). I also don't like the blur in version 2. I think it scales it down to show the file in the browser without scrolling, but the files should save at the correct size. "Or Safari is just crazy"
It appears that mobile Safari doesn't show the right image dimensions when it displays the image. iPhoto shows them as 2048x2048. Ryan, it looks like the iPad 2048x2048 wallpapers are actually 1024x1024. I checked a couple other recent images and they all had that problem. I really enjoy the look layout and colors on this one. The focus on the single screen version is just right, but I think it needs to be loosened a bit on the dual screen version. It feels like my entire desktop is out of focus except for the blue in the middle. Yes, I also experienced this image as a bit whimsical. (see Chris J's comment). Great fun! "Input for Ryan in future variations of "anemone". " Ryan, the entire family LOVES the center color and design of anemone2. But, if you look at the surrounding erea of anemone1...the color, design, detail, ect. is all around "perfect!" You lost all of that in anemone2. If you had the outter rim of #1 and the center blue of #2. You'd have it spot on! Just our observations. Thanks for listening. The Bone Family. This is really beautiful and the colors and perfect. Not all of the abstracts immediately go to my desktop, but this one sure did. Love it! Nice update! V2 is a great improvement! And I like the blue/purple pickle jar variation! So ... I'd really love to see a clownfish or two in here. I'm a diver, and seeing a couple of clownfish is one of the hilights of my dive! 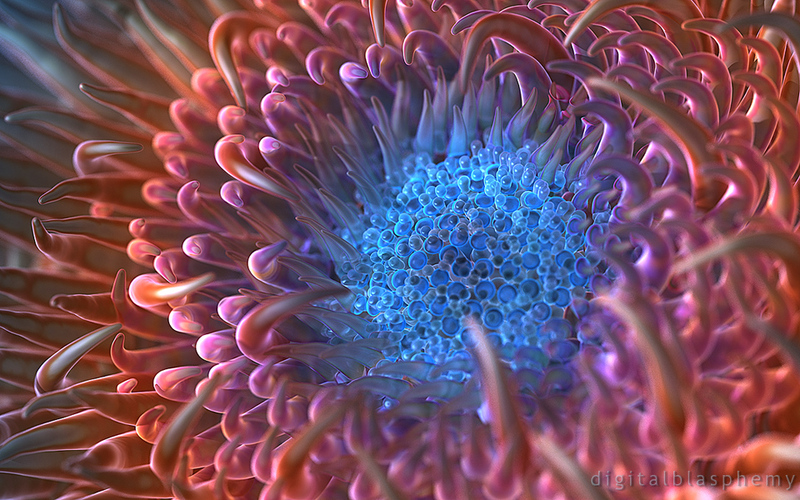 I've added a new render of "Anemone" to the gallery this morning. The camera is pulled in even more with this version and the focus is a bit tighter as well. I've also added a bit more blue in the center. The first version will remain available in the Pickle Jar for comparison. Let me know what you think of the changes! I noticed that you don't have the lossless (PNG) version listed. Also, the ZIP file of single-screen renders only has 14 resolutions while this web page has 17. Is this just because it's still a work in progress? I absolutely love the shiny and artificial look! If I saw this one underwater, I don't know if I could resist touching it... ;) And the color shift from blue to orange to purple to blue again looks fantastic! Thank you very much, Ryan, this wallpaper almost makes me want to stop rotating wallpapers each half hour! I LOVE the shiny. The glossy sheen is what captivated me. I'd like to at least see the colony view before passing judgement on this one. I've only installed it on the iPad so far, but I think the limited iPad HD crop makes it look a little off. I can't put my finger on it. Also, parts of it look a little grainy. Again, this may be a function of the iPad 3's ridiculous resolution, but I haven't seen this much noise in your other renders. Nice, but I would rather you have it against a dark ocean background like some of your older pics rather than super close-up filling the whole screen like a lot of your newer abstracts. "Could use a small touch up"
I like it, and I like these abstracts you're working on lately (if you would classify this as an abstract), but it needs a few things. The tentacles need less of a glossy sheen by a long-shot; more of a texture that absorbs light rather than reflects it. And also I don't understand why the middle has eggs in it. I know some fish lay their eggs in or near anemones, but I think just a simple mouth of an anemone would look much better. 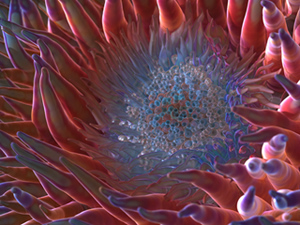 I think it's a bit off to call this "Anemone" as it is a whole different image in itself. The image is sharp and the color palette is unique, a great way to get back on the horse after the long wait from Atoll. I love how sharp this pic looks! Nice job!